This entry was posted on January 24, 2016 at 2:12 am and is filed under animal spokepersons, animals, anthropomorphic, avian, feathered friends, furry commercials, television. You can subscribe via RSS 2.0 feed to this post's comments. My favorite owl-related commercial is the classic Tootsie Pop one featuring the voice of Peter Robbins (the original voice of Charlie Brown from the pioneering Xmas special). This little boy goes to a sly fox (wearing Joe Cool sunglasses) and asks him how many licks it takes to get to the center of a TP. The fox tells him to ask the venerable old tortoise. But, alas! The tortoise doesn’t know either, since he’s always bitten his food (due to being toothless) right off the bat. That’s when he recommends the owl. The latter was drawn by the animators as wearing a collegiate professor’s cap, a la Mr. Chips. And he was voiced by the late great Paul Winchell (of Jerry Mahoney, original Gargamel, and Scrubbing Bubble fame). If I can find it (the whole thing) on Youtube, I’ll e-mail it to you. Trust me! It’s a hoot. 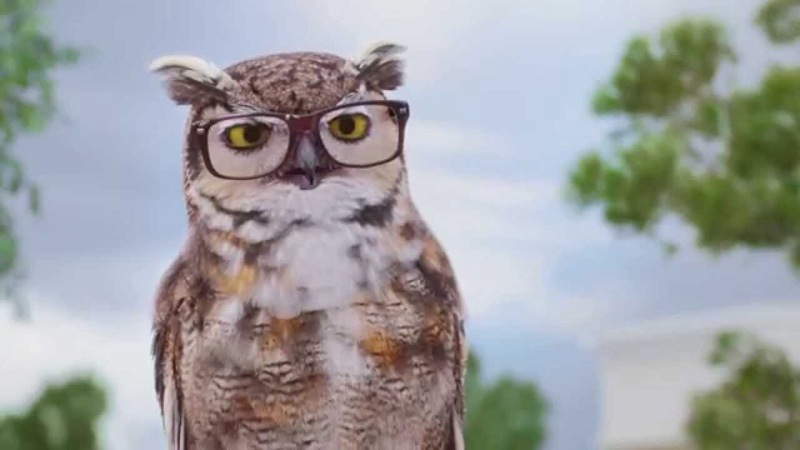 Seriously, though, there’s another trained owl commercial making the rounds. Something for a correspondence school called WGU? I remember that commercial, but hate to think of how many years it’s been since it aired!